NGC 4244 (also known as the Silver Needle Galaxy and Caldwell 26) is a spiral galaxy of roughly 65,000 light-years across that lies some 14 million light-years away in the constellation of Canes Venatici (the Hunting Dogs), while it is receding from us at approximately 244 kilometers per second. It is part of the M94 Group (also known as the Canes Venatici I Group), a group of about 24 galaxies relatively close to our Local Group. 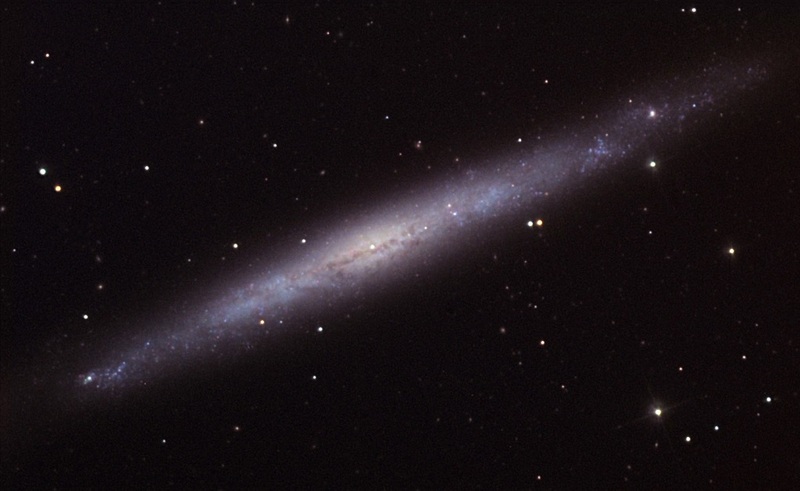 Seen edge-on, this galaxy has a truncated dusty disk and loosely wound spiral arms. Numerous emission nebulae can be seen in the long tracings of the spiral arms as well as a delicate dust lanes surrounding the nucleus. At the center of NGC 4244 is a stellar halo, and well above the disk, a second stellar halo can be seen. It has a low star formation rate of only 0.12 stellar mass per year. Like many spiral galaxies, NGC 4244 harbors a tiny but massive nuclear star cluster with a flattened shape at its center. These nuclear star clusters are significant conglomerates of stars about the same size as normal globular clusters. But, their masses are coupled to the mass of their host galaxy and, like massive black holes, the formation of these clusters are linked to the formation of their host galaxy. The most significant of NGC 4244’s nuclear star cluster is that it is strongly rotating at about 30 kilometers per second within the central 32 light-years radius. You can find NGC 4244 near the bright star Beta Canum Venaticorum, barred spiral galaxy NGC 4151, and irregular galaxy NGC 4214.